The Audubon Center & Sanctuary can help you learn how to attract birds to your garden and invites you to help scientists by participating in the Great Backyard Bird Count. “Bird Feeding 101” will be held Saturday, Feb. 16 at the Audubon Center and Sanctuary, 1600 Riverside Road, Jamestown. You can choose one topic during each of the two time periods. How to identify common backyard birds and learn what to look for in a field guide. How to build small bird feeders for your yard, with an extra fee of $8 for the feeder. How to identify birds and count them for the Great Backyard Bird Count. Also learn what birds prefer what types of seeds. The classes will be taught by Jeff Tome, Audubon senior naturalist, and Hope Lyon, seasonal naturalist. The cost is $12 for adults, $10 for Friends of the Nature Center and $5 for children 9 years and older. 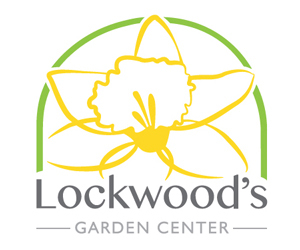 There are extra fees for optional materials ($8 for the bird feeder or $2 for the feed mix). Class size is limited and reservations are required by Thursday, Feb. 14. To make reservations, call (716) 569-2345, email info@jamestownaudubon.org, or go to the Audubon website. You can learn how to get a bird to eat out of your hand during Bird Feeding 101 at the Audubon Center and Sanctuary in Jamestown. 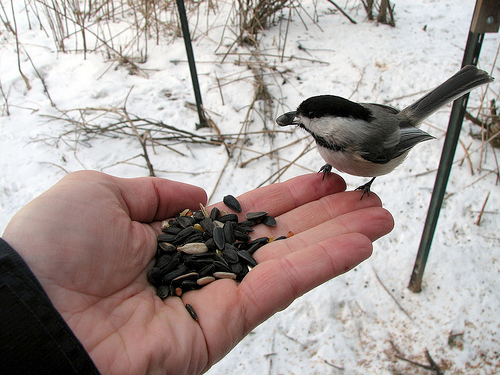 Jeff Tome, Audubon senior naturalist, took this photo of a chickadee eating from his own hand. The Great Backyard Bird Count is a joint project of the Cornell Lab of Ornithology and National Audubon Society, along with their partner Bird Studies Canada. People of all ages and skill levels are needed to count birds in their yards, neighborhoods or other locations. Data from the Great Backyard Bird Count can provide an early signal of changes in bird populations. With thousands of people reporting what they see, scientists can detect changes in birds’ numbers and locations from year to year. Participation is easy. Simply watch birds for at least 15 minutes on any day of the count – Friday through Monday, February 15­­–18. Then go to www.birdcount.org. Estimate the number of birds you see for each species you can identify. You’ll select your location on a map, answer a few questions, enter your tallies and then submit your data to share your sightings with others around the world. You can also participate at the Audubon Center and Sanctuary. This is an exciting opportunity for those who would like to try the hobby of bird watching for the first time. Winter hours for the Nature Center are 10 a.m.-4:30 p.m. on Mondays and Saturdays and 1-4:30 p.m. Sundays. Visitors can use the sanctuary’s more than five miles of trails daily, dawn to dusk. The www.birdcount.org site also has bird identification tips, instructions and past results. Anyone can watch as the tallies come in at that site. During the 2012 count, participants reported 17.4 million bird observations on 104,000 checklists. Snowy Owls thrilled many participants when these striking birds of prey ventured south from the Arctic in record numbers. This year scientists predict that U.S. and Canadian bird watchers will see an influx of Red-breasted Nuthatches and winter finches, such as Pine Siskin, because of scarce food supplies on their northern wintering grounds. 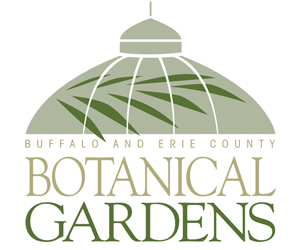 To learn more about the the Audubon Center and its many programs, go to its website or call (716) 569-2345. 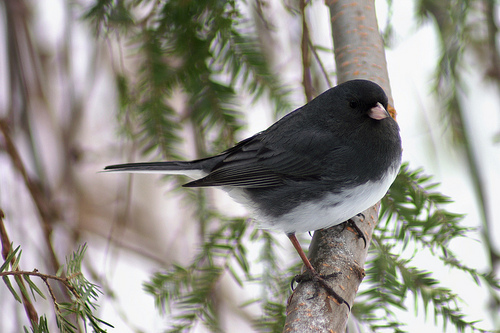 Photo of the junco at the beginning of this article is by Terry LeBaron, a volunteer at the Audubon Center and Sanctuary. I very much enjoy the birds that visit, but it is hard to count them when there are so many. I have gotten a few oddities this year which are most interesting. I have sent them off to Cornell for ID.